In 2014, Jennifer and I attended the Ponca Colorfest. The intention was to paint on the lawn of the elk center with the other artists showing and demonstrating their wares, but the idea of sitting in a mowed yard with a bunch of tents and artists/photographers wasn’t very inspiring, so we moved on. 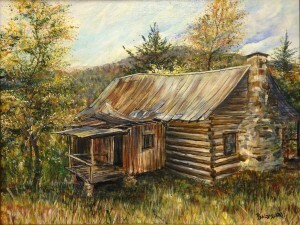 Beaver Jim Villines was one of the first settlers in the Boxley Valley. This is the second cabin he built, up on the hill above the Ponca Bridge Canoe launch. This 11×14 Framed Acrylic Painting is available at the Nelms Gallery in Jasper. A limited number of 8×10 prints matted to 11×14 are available with or without a frame.